It's amazing the things you can create with paper and these modular lamps are no exception. Each one is uniquely different and definitely makes a statement. How to Turn a Tin Can into a Stylish, Industrial Table Lamp! 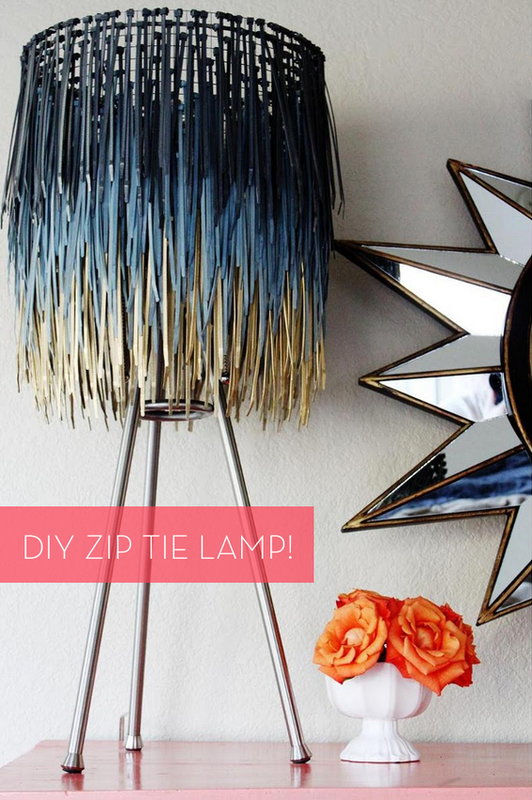 Before you toss that tin can in the recycling bin, take a look at this clever DIY lighting idea! A Glam Bam Floor Lamp Makeover! All this talk of kitchens and cooking spaces and whatnot has me looking around at all the ways to spruce up my dining room. I got a little sidetracked when I saw this alternate use for a cheap plastic placemat. Forget the kitchen, we're headed to the bedroom. Images removed at the request of Better Homes and Gardens. Sorry, everyone! It's no secret that we all have pieces in our homes that we once loved and now are just tired of looking at. Maybe they're tucked away in a closet because we feel guilty about tossing them just yet, or they're still out because you've yet to buy a replacement piece, or maybe they're in the Goodwill pile in your guest room (Guilty.). But sometimes all it takes is a glimmer of potential to renew your love of something. Like, oh, say maybe a plain ceramic lamp.